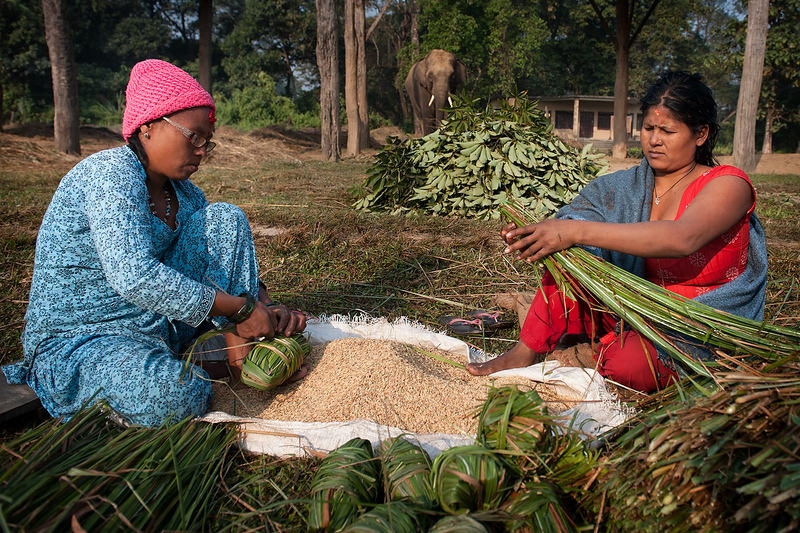 Female mahouts Meena Mahato (L) and Meena Chowdry (R) prepare food for elephants. As Meena Chowdry's elephant run away, the two colleagues are taking care of one elephant. In the stable two mahoouts are designated to look after one elephant. Elephant stable, Hattisar Soura, has 16 elephants and 30 handlers. Among elephant handlers there are also two female handlers. It is the state run stable and the government appoints all employees. The stable caters mainly tourists for safari in Chitwan national park. Elephant handlers live in compound with very basic facilities. None of the mahouts has families living with them in a stable except one whose children live with him in order to attend the school in the village. With the wages not exceeding USD 15 per month, mahouts and their families live on the brink of existence.